Core Temp is a compact, no fuss, small footprint, yet powerful program to monitor processor temperature and other vital information. What makes Core Temp unique is the way it works. It is capable of displaying a temperature of each individual core of every processor in your system! You can see temperature fluctuations in real time with varying workloads. 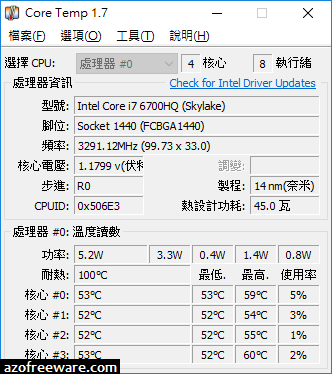 Core Temp is also motherboard agnostic.